VKVVF was fortunate enough to have Mananeeya Nivedita Didi, (Vice President of Vivekananda Kendra)on the 17th and 18th of November. 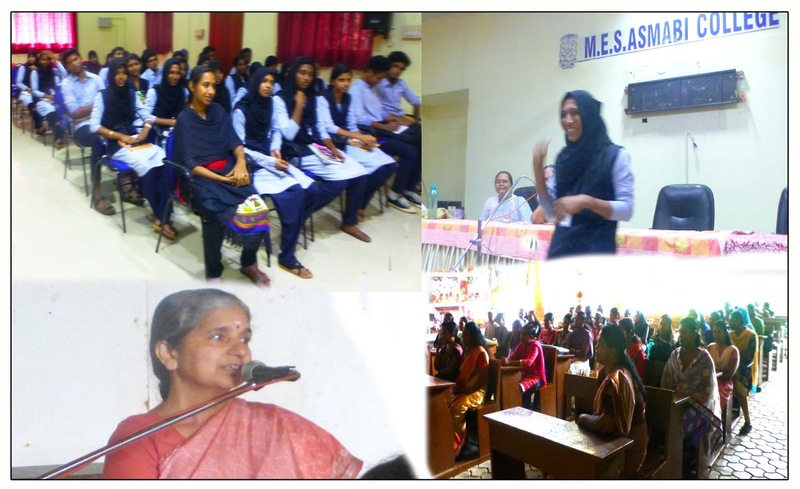 On the 17th morning, an hour-long talk on Sister Nivedita and her idea of Education was delivered by her at Hindi Prachar Kendra, Kodungallur for the benefit of B.Ed students . Fifty students attended. How Sister, transformed herself under the able guidance of Swami Vivekananda and how she applied her unique methods of teaching for the all-round development of the girls of the school which she established in Kolkata. The key points highlighted by her were the essential qualities of a budding teacher. On the 18th morning, at Asmabi College, Mannaneeya Nivedita Didi spoke to the first year B.A.and BSc students. Dr.Ranjit and Dr Mrs Soorya Ranjit both from the Hindi department of the college arranged the talk.She told them about Sister Nivedita who was trained by Swami Vivekananda when she came to India to serve Mother India.The qualities required to be an able student were - All knowledge is within us, the need is of self-confidence which Sister Nivedita stressed on. She narrated how Sister prepared her girl students some of who were child widows, to become faculty members of the Vishwa Bharati International University of Rabindranath Tagore, at Shantiniketan. The second quality needed for a student is to know how to learn and for this, concentration is a must, like that of Swami Vivekananda who was known for his photographic memory. Concentration can be increased by developing self-control. Again along with concentration, detachment also must be practised. Another important method was -TCI (Topic-Concept-Information) technique. This was how Sister Nivedita taught her girls. She also mentioned that, a student should understand his or her oneness with nature since each of them was a spark of the Divine, hence one has to give more than take. That is what Sister Nivedita made her students understand. She taught her girl students everything including the pride for their family, society and country. The whole talk was delivered in simple Hindi which the students listened with rapt attention. Lastly one of the girls came and delivered a beautiful vote of thanks. 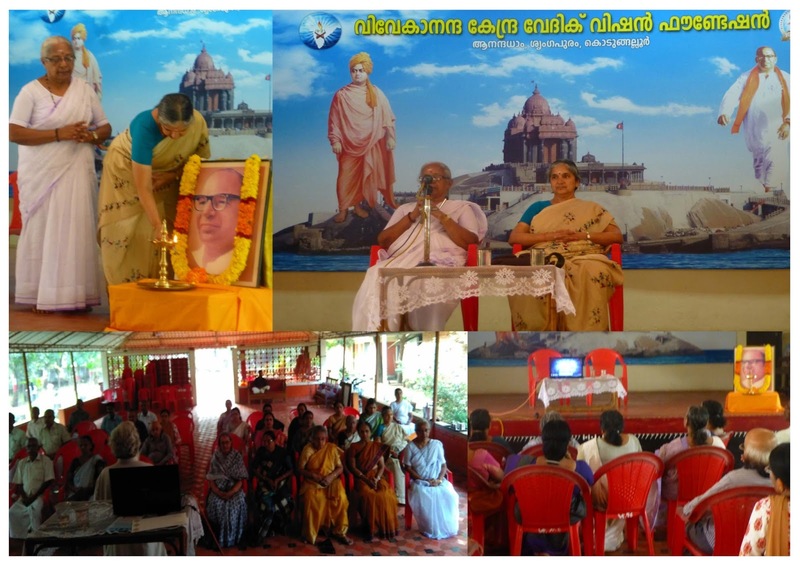 On the eve of Mananeeya Eknathji's birthday, there was a gathering of senior citizens at Anandadham to participate in the 'Santwanam' programme meant for the retired teachers who were honoured by V.K.Vedic Vision on Gurupurnima day, all the elderly well-wishers and karyakartas of Kendra. Taking the opportunity of the presence of Mananeeya Nivedita Didi's at Anandadham on the 18th evening , the unique programme was arranged. Man. Nivedita Didi's talk was on the four Ashrama system of our Indian culture and how it bound the people of all ages together, how it helped to build up the inclusive nature of every child as it grew up to be a man with dignity and total personality . She stressed on the duties of a Vanaprasthi for the society in which he or she lived. Inaugural talk was followed by a short meditation session conducted by Sri Sudhakarji, a video clipping on Sri Narayan Guru's 'Daiva Dashakam'. The programme ended with Kendra prarthana, with an assurance to all that 'Swantanam' was a monthly programme for all the vanaprasthis who had responded to this programme. 25 people attended the programme.